Following up on Wanda Halbert's request at the CIP hearing May 21, and Barbara Ware's concerns at the O&M hearing May 8, the RDC came before the Parks Committee Tuesday to explain themselves and the Master Plan. I have broken it into three sections. [Part 1] [Part 2] [Part 3] This is Part 1. Click here to read more.Click here to listen to the entire, 33-minute discussion (5.9 MB MP3). Click here to listen to the 12-minute audio of Part 1 (2.1 MB MP3). STRICKLAND: Okay, I’ll just let you all take the floor. STRICKLAND: Mr. Duckett, just a moment, I’m sorry...Ms. Halbert? HALBERT: Before you all begin, during the budget process we kept hearing about a Master Plan. The question I specifically wanted to know is, has the Master Plan, has it been altered since the conception of this project. If so, has the Council approved whatever it is…? Is the Plan still the same, and if not, has the Council approved the changes? I guess it will be a bit redundant, I will direct the initial question because it is embedded in the presentation, Councilwoman Halbert, as it relates to the Master Plan. But approximately in 2002 the Riverfront Development Corporation engaged in a lengthy process to develop its planned vision for the riverfront. There were several stakeholder meetings, I want to say from memory roughly about 25 different special interest groups, ranging from Corps of Engineers to various community groups as well as there were two if not more public meetings held on that process. We contracted with a firm Cooper Robertson and Partners to develop or help us develop that Master Plan. And it was approved with great fanfare, both from the community as well as the City Council. But one of the…well two, so fundamental, principles came through that Plan. One was that the citizens of Memphis wanted to reconnect to the river. And then the other, overarching thing that came out of that process was that the water’s edge belongs to the public. Those have been two of the fundamental, guiding, planning principles that we have used in developing the plan, of which we have a copy and we will provide it to you today, but there are various components, one of which you probably, might recall a component within it entailed the Land Bridge, which was designed to reconnect the city to its river’s edge, and that is one component which you will see that has been changed from the initial 2002 plan that was presented and we came back to City Council and made a presentation to City Council and City Council approved the elimination of the that from the plan. But I think one of the key things to remember as it relates to the book, “Master Plan:” It is a planning guidebook. It is not a static document incapable of change, but it is the tool that we use to guide us in any of the interim projects that we undertake on behalf of the City of Memphis. LENDERMON: We’ll try to get through this as quickly as possible. Everybody knows that this came out of... actually it was Mayor Herenton’s efforts to reconnect the City to the river. In 2000, the RDC was created as a 501(c)(3) entity, a private-public partnership. We’re governed by a board of directors, we’re self-created. Our relationship with the City is by contract only. Certainly the City…Within our charter the CAO, the Mayor, and the City Council Chairman are members of the Board. But beyond that it is actually a separate entity and the Board of Directors are self-perpetuating, if you would. STRICKLAND: I don’t mean to…well I guess I did mean to interrupt you because I did. If you could sort of fast-forward and get to the Master Plan itself. STRICKLAND: She just stepped out to take a call. STRICKLAND: Our council asks a lot of questions, and I don’t want your presentation to take 25 minutes and then have no time for questions. So, do you have Master Plans you can pass out, or is it going to be on the screen? LENDERMON: I mean, we…I think the Council’s already been given copies of the Master Plan, on several occasions, too. We certainly have some more, a couple more copies if anyone wants any. STRICKLAND: Did you want this background or did you want to get right to the Master Plan? DUCKETT: In terms of the project…Sorry, the presentation, in terms of the Master Plan, it only talks about three components, one basically what it is and the process we went through in defining it. It doesn’t outline every component of the Master Plan. STRICKLAND: If you’d just tell us, then. LENDERMON: When RDC was created, we were charged with two things. One, the job of operating the existing parks. And we entered a contract to do it at basically what the City was spending at that time. And we operate the parks, we made inquiries, and we hopefully made them better. The other thing at the same time, we were looking at the planning process for the whole riverfront. And we engaged Cooper Robertson, which is a firm out of New York City, they’d done Battery Park City in New York, they’d worked in Baltimore, they’ve worked in Boston, they’ve worked in a number of other famous waterfronts. And they were selected out of a panel of, a number of people of, I think, 17 firms we were considering. We had an eighteen-month-long Master Planning process. During that eighteen-month process, if memory serves me correct, I think we had 75 meetings Dorchelle? 75 separate meetings with groups anywhere from five to 25 people. They would be anywhere from downtown stakeholders, to historic preservationists, to bankers, to…whoever. They were all the stakeholders if you would. We also had three larger, public meetings. I think the attendance at those, probably, the smallest we had at any one of those large public meetings was 200 and the maximum may have been, I know we had 250 chairs and awe had many people were standing up, so I don’t know how many people were there, 300, 400 people. And that was at AutoZone Park, in the lobby of AutoZone Park. The Master Plan actually was based upon the concept of re-connecting Memphis to the river. Connecting all these we have a number of things that one, needed to be connected; we need to improve our connections; we need to improve our access to the water. We have visual access but no physical access. And, that the water’s edge belonged to the public. That became sort of the governing, if you would, themes throughout the Master Plan. And how to do that included a number of individual projects. Again the Master Plan’s looking at a five-mile stretch of river, going all the way from the north edge of Mud Island, all the way down to Chickasaw Heritage Park. And so in doing that it included a number of things… The Master Plan looked at things from like a 50,000-foot level, if you would. It talks about concepts. It talks about connections. It didn’t say HOW to connect a walkway. For instance, the walkway that some of you were at the groundbreaking, or at the ribbon-cutting ceremony for the walkway going behind Ashburn Coppock Park and connecting the old Martyr’s Park behind the old Rivermont. LENDERMON: So in the Meantime, we did projects. We did a number of projects. Some of them were mentioned specifically in the Master Plan, some of them weren’t. Tom Lee Memorial. The Master Plan certainly talked about telling our story in signage. It never talked about Tom Lee Memorial as a specific project. But we created with the Council’s assistance and concurrence, and it’s a project we think turned out very well, although it wasn’t mentioned specifically in the Master Plan. Globally, conceptually, signage was, but it, as a project, was not. Following up on Wanda Halbert's request at the CIP hearing May 21, and Barbara Ware's concerns at the O&M hearing May 8, the RDC came before the Parks Committee Tuesday to explain themselves and the Master Plan. I have broken it into three sections. [Part 1] [Part 2] [Part 3] This is part 2, focusing mainly on the Master Planning process, the land bridge, and the Public Promenade. LENDERMON: And the biggest change to the Master Plan was, the Master Plan included a very transformational element, which was a land bridge connecting Mud Island River Park to the mainland. And that was to solve this detached problem we had with Mud Island River Park from downtown. That was included in the Master Plan. About two years, or a year and a half into the process, the Board of Directors decided they thought that while that might be a good plan thirty-plus years from now, certainly nothing was going to be done in the foreseeable future. They thought that putting time and effort on that detracted from everything else, and they wanted to jettison that from the Master Plan. They took that action, they brought that to City Council. The City Council concurred. The City Council voted also to amend the Master Plan to take element out of it. So, because of that, one thing that exists with the Master Plan is, whatever happens eventually when you took the Land Bridge out, then Mud island becomes a little bit more of an unsolved mystery, if you would, in that there is no immediate solution to solving all the problems with Mud Island River Park. That’s why we were mentioning before, we’re working with Robert Lipscomb, and hoping to bring to you a concept of looking forward with zeroing in and having another planning effort specifically for Mud Island project itself, because we think we need to get public involvement in looking at that in much more detail, so that whenever people like in… Before, we’ve have people come to us and want to put a major skateboard park in the tip of Mud Island, and we’ve had, as part of the Pyramid discussion especially, Ericson wanted to do other things with Mud Island. We thought that there is no…we have no quote “public input base” to deal with those responses one way or the other. We have what we think, and we have what individual [??] may think, as a public… We haven’t vetted those issues publically. We think we need to. And hopefully, in the very short future, we’d bring that back to you. The other thing we did is…the Master Plan…we brought in the Urban Land Institute to look at the Master Plan after it was done. The Urban Land Institute is a very large planning organization, 10,000 professionals. They looked at the reality of how to implement certain of those concepts. And the Urban Land Institute Basically changed our… They didn’t change any of the concepts in the Master Plan, they basically changed our priorities. They said that we ought to be looking at… The biggest piece, the biggest missing link in the Riverfront exists in those four blocks of property we’ve known, called the Promenade. I guess the big reason around the Promenade was, this is how Memphis looked in the 1800s, and you see the dark area is the Promenade. And this is, the next slide shows how it looks today you see all that new green space has been added along there [POINTING TO MUD ISLAND], which is what sort of sort of changes the idea of what the Promenade ought to be. If we still looked like what we looked like in the 1800s, well then we think the Promenade would look like something different. So that became the controversial piece of our process. Now, we think…we produced a plan to show a mixed-use development incorporated with public space. We presented that to City Council as part of again a planning process that had I think three public meetings. We brought the City Council in a very contested environment. I think on a 10 to 3 vote, the Promenade Plan was approved, in 2004 I believe. At that point, as we’ve discussed with Councilwoman Ware before, we have done the public process, we presented our concepts, City Council approved our concepts. There are legal issues concerning the property itself. Those can only be resolved by the City administration and the City Attorney. And for us to do anything else requires action by the City administration and the City Attorney and, we assume, concurrence by the City Council. We don’t know that, we assume that’s what it takes. And so, we’re like, we’ve become subsidiary to their directions, and we haven’t had any discussion with them in some time on that issue. And then, as far as the Master Plan…what we assume [?] is…we think the Master Plan is basically a… It talks about general concepts. It talks about general principles. It’s a…it becomes a living document, that is frankly changed and amended as this City Council approves or disapproves certain capital improvement projects we bring to you. STRICKLAND: Mr. Boyd and Ms. Halbert. BOYD: Alright, the cobblestone use. I’ve received a lot of calls, a lot of correspondence I should say, will the excursion boats [portion inaudible]. Will they have an opportunity to tie up at the cobblestones? LENDERMON: Yes. In fact they’d probably have to tie up there. They’ll probably have to tie their boats up there. LENDERMON: They will pick up and drop off passengers at Beale Street Landing, in a safe environment that people can get to. They will quote “stage” their boats if you would at the Cobble…or at least SOME of their boats at the Cobblestones. So they’ll have a presence at the Cobblestones, but they’ll do picking up and dropping off of passengers from Beale Street Landing, in a safe manner in an ADA-acceptable manner. BOYD: Alright, that’s…thank you I appreciate that. A lot of people have concerns about retaining that look of boats on the Cobblestones. Are there any plans to bring back the land bridge proposal? DUCKETT: Not at this time. That’s a big component of this project, but if you don’t have the funding then why even talk about it. LENDERMON: I mean, after we’re dead and gone, somebody else can bring it back. BOYD: When the company recommended, as you mentioned a moment ago, that the RDC concentrate on developing the Promenade area, I guess this is a question [inaudible]. Now that circle, is that circle just north of the Pyramid where you show the turnaround. DUCKETT: It’s a roundabout. That’s on Mud Island. BOYD: Now was that turnaround north of the Pyramid, was that part of your all’s project? LENDERMON: No. And that was not part of our CIP budget either. The way that came about was, the City administration approached us about wanting to deal with the traffic issue at Auction Street. And they wanted to do an innovative traffic circle, and they wanted to know if we would build it for them, as a traffic control piece, and do it in an attractive way. That’s how the project came about. The funding was never in our quote “CIP budget” In the course of the CIP that you Council Members approved, you won’t find the traffic circle because it never existed as one of our projects. It basically was a City of Memphis project that we did for them on a contract. We sort of take a little credit for it in our slides, but it wasn’t part of our plan or program. BOYD: Last question, Mr. Chairman. I’d like for you to answer this. A few weeks ago in regard to the little green area where the up growth of trees are, between the Cobblestone area and the parking lot. LENDERMON: Right. Point-four acres of wetlands. BOYD: Point-four [0.4] acres of wetlands. You said that would be replaced in a four-to-one ratio with park up in the Wolf River area? LENDERMON: Right. In the Wolf River flood control basin somewhere. BOYD: And that [0.4 acres] would be replaced by the Landing. LENDERMON: Yes. At the time that the Landing is constructed we are required by our permitting to also construct these wetlands and maintain these wetlands consistent with their requirements, on our 404 permit. Apart from all the spin, I can't let some of these representations stand alone without counterpoint. Lendermon says that the land bridge (pictured below) would connect Mud Island River Park to the mainland. Later on, he leaves us with the impression that the land bridge would have solved some of MIRP's "problems." In fact, the land bridge design would have eliminated MIRP and the monorail. If anything, the land bridge would be a "connection" between the residents of upper Mud Island (Harbortown and future developments) and downtown. It would be another way to get downtown and back by auto. Second, though he says the land bridge was "transformational," he goes on to downplay the it as just "a component" of the Master Plan that the RDC and City Council decided later to "jettison." In fact, the land bridge (and the lake it would have created) was no less than the centerpiece of the Master Plan, which devoted pages and pages touting it. It was also more than half of the plan, if you look at the mixed-use development that was proposed for the land bridge. By my calculations, 60 per cent. Jettisoning it literally gutted the Cooper Robertson proposal. Furthermore, the RDC has never updated this so-called "living document" to account for the major change. All that's known about this change is a mere two-line City Council resolution in January, 2006. Adopted a resolution supporting the removal of the Land Bridge component from the Memphis Riverfront Master Plan of the Riverfront Development Corporation. Lendermon describes the Promenade Plan as the controversial component, but neglects to mention that the land bridge and lake has turned out to be even more controversial -- just not during the original 2002 City Council meeting when it was approved. By 2005, the rising public heat over land bridge was the very reason the RDC had to "jettison" it. The land bridge, from a drawing in the Cooper Robertson Master Plan. I have added the street names and indicated where the existing harbor, museum, and monorail are. Following up on Wanda Halbert's request at the CIP hearing May 21, and Barbara Ware's concerns at the O&M hearing May 8, the RDC came before the Parks Committee Tuesday to explain themselves and the Master Plan. I have broken it into three sections. [Part 1] [Part 2] [Part 3] This is Part 3, with Wanda Halbert's questioning. HALBERT: Thank you; I do have a few questions. Regarding the Master Plan, I’m a little confused because to me a Master Plan means one thing. A Master Plan generally sets the direction of a concept or an idea. But you all have said that your Master Plan is a planning guide that doesn’t outline every component of the plan. Well, what is the plan? HALBERT: I’m understanding a little better now, but I have to be honest with you and tell you what my concern is. This belongs to the City. But we’re turning this into something else. I’m just telling you the perception that I’m getting. I’ve been very confused about what RDC is, and what its purposes…I mean who, what, when, where, how, why, how long… I’ve just been very confused. But what you just said has helped me understand. RDC is really kind of driving a lot of what happens down here. But the City should be driving what happens. And even if they want to engage a relationship with RDC and get you to help us implement it, then that would make much more sense to me as a City official. But right now, this looks like something else. And I don’t want to get into the detailed discussion about that because that’s something I need to hear from the administration, because..
My thinking is, somewhere in our administration, someone should have […] the background, the expertise to say, “Well Mayor I know this organization can help us put this concept together,” But that people in the administration should be working hand-in-hand with you, and the administration should be presenting what you all are ultimately presenting. Because for me, this really looks like, this is your all’s plan, this is RDC’s project, this is not a City project. And I just say that respectfully. And the mere fact that you delineated what that Master Plan is, it makes a lot more sense to me now. DUCKETT: Yeah. If I could, what you’re saying, it’s a philosophical issue. I commend the City Mayor. He realized that in order to bring long-term stability to redesigning in the aggregate our riverfront, there needed to be a constant body that’s sole purpose was focusing on it. Now the checks and balances implicit in this design going forward was one: The way the entity was structured it is populated with officials from City government: The City Council chair, the Parks department chair, the CAO, and a number of other members. Two: Another check and balance is, we can’t do anything without coming to this body, and asking this body for the funding. So that’s another check and balance on what we, as a 501(c)(3) independent body is doing. Now what we might need to do a better job of is, as we talk about projects, make sure we keep you the City Council better apprised of the projects we are thinking, before we come and dump it on you as a request for funding. DUCKETT: I think I understand what you’re saying. HALBERT: …because this is looking like an RDC project, and I didn’t understand that. And it is not just RDC. There are some other projects throughout the City, you know, Zoom. Some of what the Council members, some of us being new, I mean we don’t know what all this history is, and it’s just not quite making a whole lot of sense. It’s almost appearing as if the City has basically turned over facets of the City to different organizations, but then they got to come back to us, and we got to fund it and…I mean, I just want to say, someone told me you used to work for the city. Heck I would have loved to see you work for the City and do some of this FOR the City. LENDERMON: I worked for the City 25 years. HALBERT: Well, I’m talking about this kind of project because when I hear a Cindy Buchanan or some of these other directors talk about the expertise in these management groups... I mean the management used to be our management and now you’re outside of management and you’re the one who knows how to do all of this. And so it almost looks like were paying twice, for something should have been doing as a City administration anyway. And then, two final comments that I have and I know we’re short on time, and we’re going to have t at some time to come back, because now it makes me bring up some more questions that I have for the administration, but on these changes: Has the Council been made aware of all of the changes, and not only be made aware of them, but VOTED on the changes, because I did hear the word, “apprised.” So I need to get the administration to tell us, where did this come from, where was it when it was first developed, how has it changed since first developed, and the fact that the Council has approved those changes, because that’s a little cloudy for me. DUCKETT: It’s part of the Beale Street Landing project. LENDERMON: It’s not in there [on screen], it must be somewhere else. There’s a 50 car parking lot that’s adjacent to, that’s incorporated with the Beale Street Landing CIP project. As compared to…the parking lot that exists there now is 120 cars. You see [points to screen], that is the park as it exists now, and right here there’s a little 50 car parking garage [sic], this is the green roof, this is a building, this is again two acres of Tom Lee Park, and the built-out four acres. But this little 50 acre [sic] parking lot right here, landscaped real heavily right here, open here so that it will accommodate Memphis in May. But we feel there has to be some parking somewhere near there for people to access the boats. LENDERMON: Understand. But the parking there specifically…our project at first didn’t include any parking. The City Council asked us to include parking. I can understand putting together a concept that we think may take up to 50 years. But we hire the experts to come in and, here’s our direction, this is what we need to do, whether we agree to it together… But if this is going to be going on for 50 years, I mean even though we’re approving it five years, to me the City needs show, where is your ownership of this? What is the CITY’S direction? It’s just…that to me is where some of the confusion is coming from. I don’t see…what I see in you, the leadership in you and the expertise; I need to be seeing that for the City. And I’m missing that. And I’m going to talk to the Mayor, and I hope his administration is listening. They need to have ownership of this, and they need to tell us, where are we going with this. I mean, I’m feeling like other entities OWN the City’s business. And that’s just how it looks to me. And again it’s not just the RDC it’s throughout the City. And we’ve got to address that because that part…I want [???] and Orange Mound to look just like Tom Lee. But nobody’s talking about that because they’re only interested in what’s happening downtown. My neighborhood doesn’t look like that. Apart from all the spin, there is a misrepresentation here that I cannot let stand without clarification. Lendermon says the there was no parking lot originally and that City Council asked for the parking lot. 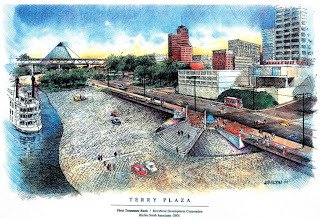 While there may not have been a parking lot in the original contest submission from Argentina, there has long been a parking lot in the subsequent, evolving design of Beale Street Landing. Originally it was to be underneath the restaurant. Due to water table levels, it was later decided not to be feasible there, and it was replaced some time last year by outside parking covering a section of Tom Lee Park. The City Council did not ask for it. It came as a big surprise to them when it was noticed in a City Council committee meeting last fall. Halbert: What is the Master Plan? At the recent CIP budget hearings, Councilwoman Wanda Halbert asked a variety questions, beginning with: What exactly is the Master Plan? Click here to read more.Click here to listen to the 10-minute discussion (1.8 MB MP3). My transcription of the discussion follows below. HALBERT: I have a couple of general questions. I am still trying to figure out, I haven’t had an opportunity to really study the RDC and exactly what all it entails. Is this the original Master Plan that you all came up with when you created this concept? LENDERMON: This was one of the projects included out of the original Master Plan. LENDERMON: No, no this book was actually was just…we printed this book yesterday [LAUGHTER] This book is just pictures depicting the projects included in this years Capital Improvements Program and all these issues frankly were included in the Master Plan. It is just a very small portion of it. HALBERT: Now I’m not sure, I may be the only person…do we have a copy of whatever the Master Plan is? That’s what I’m trying to figure out. I’m getting so many documents, I can’t figure…are we adding to the plan? Or what are we doing? [RDC CHAIRMAN GREG] DUCKETT: And I’m not sure if we have provided to all the new members of the Council a copy of the Master Plan. I don’t know if we’ve done that. If we haven’t, we will get you a copy of it. But these are, other than the major maintenance, are components of the initial Master Plan that was developed as part of the RDC effort. So these are individual projects that are referenced within the Master Plan. HALBERT: For me…it’s like Councilman Flinn said, I’ve seen several documents, but I’m not sure exactly what RDC is, and I need to get a better understanding of that, and I’m not even sure why it was created and what the plan…I mean how long do we plan on it being here? VOICE: Fifty years, at least. STRICKLAND: The Master plan was a fifty year plan, wasn’t it? DUCKETT: Yes but I was confused…When you say “it being here” are you referring to the Master Plan or are you referring to the RDC? HALBERT: Master Plan…RDC…I mean it’s one and the same…A fifty-year plan? DUCKETT: Well the Master Plan is a long-term plan. Because in order to accomplish many of the things that are outlined in the Master Plan just from a sheer funding perspective, it will take several; years to amass the resources to build it. Now in terms of RDC’s existence, I guess the only way I can answer that is, what is the current contract with the City of Memphis. [CROSSTALK] It’s a contractual relationship that is renewed in five-year increments. Or at least is HAS been renewed on five year [intervals?]. HALBERT: Now…Councilman Ware talked about the private opportunity to be able to get things done [versus?] government. And I noticed Mr. Sherman, I was wanting to know specifically why is it that government costs so much more or the perception is that it costs so much more to get projects like this done through government versus private industry. SHERMAN: Thank you Mr. Chairman. In the private industry typically, you know, private corporations or the individual that’s building the facility, they would typically go to contract, after they’ve taken bids, within 30 days. Our process, in city government, is at least 120 days. And as I mentioned I think last week, that 120 days is costing us a great deal of money as inflation and oil prices put everything in flux on pricing. There has been a time last year; steel venders were only holding their prices for less than 24 hours. Yet we ask our vendors to hold their prices absolute for 120 days. So, they have to build in inflation, because they know it will take that long for us to go through the establish checks and balances, to go through, appropriately, the City government procedures. So that is one of the factors. It takes us about 60 to 70 days to get a design contract through the City’s system to even start design. As we go through that design there is a period that we come to City Council to present a continuing resolution to your body, to keep you apprised of the status of the project, and that stops the project for almost eight weeks while we bring those documents to you for approval and we wait for the minutes to be approved through the full Council sessions. So some of those hurdles private industry does not have to face. It doesn’t mean it’s bad, it means it’s just a fact of doing business with government. HALBERT: Is there a better way that we can do it, as government? I mean we can do our part so that we don’t have to deal with this big issue, because this is going to be an ongoing issue, if we’re not going to [inaudible]. SHERMAN: There is better ways, and I think that by pulling the appropriate divisions together and Council and talking about that in the right setting, I think we can find some ways to appropriately save time and still have the appropriate checks and balances that the Finance Division needs, and the Council needs, and Engineering would accomplish our goals to move the process forward. HALBERT: Two very quick things. One is a comment. I know we were kind of joking a little bit about the Downtown Neighborhood Association and the South Main [Association], but we did have an issue to come up in our meeting last night, where it appeared the South Main Association was left out of some communications or something. So, is there any particular reason why they’re not included in the presentations or discussions? LENDERMON: We’ve made presentations to them before just like anybody, just like Harbortown Association. I mean, we normally meet with them at their request, more than we involving them. We do have…our board does include whatever the current president of the Downtown Neighborhood Association as an ex officio member of our board…assuming the Downtown Neighborhood Association includes both Harbortown, South Main, and the rest of downtown. BOYD: Did you also have some required open meetings to the public? LENDERMON: Absolutely. I mean when there’s a public meeting, we send out notices to everyone. But it depends on what you’re specifically talking about. Like for instance the Law School Project. It really hasn’t had much public visibility yet because it doesn’t really exist until you as a body decide you want to fund it. So we aren’t yet having any formalized meetings that we’re spending money on because it doesn’t exist as a project yet. But once it does, we will. HALBERT: Well I think that the reason that I’m asking that is when we live in different neighborhoods throughout the city, as certain neighborhood groups are informed about different things and others are not, then… You’ve got to be inclusive, because it’s not real good to make that assumption that the next person is telling the next person. It appears that you all would want to be more inclusive, because when it comes to us, if people are starting to object to issues that are going on, particulars of projects, and they tell us that they weren’t even notified, then therein lies a problem because that’s’ a part of a process that is established through OPD, for when we make approval. So that would probably be a good thing to include all of them on the projects. LENDERMON: No, I was trying to answer the question, is there any additional cost to the City for the operation of this Beale Street Landing, once it’s completed. And what the statement was, what we stated from the very beginning was, we will operate that within the existing dollars the City is giving us now, hoping to make enough revenue off of the little restaurant and whatever else is there to come close to breaking even. HALBERT: If we could get that Master plan, I’m just, I’m a little…I need to figure out exactly what this concept really is all about. Thank you. At the recent CIP budget hearings, RDC's Benny Lendermon was asked by Councilman Shea Flinn to explain why we're spending $30 million on Beale Street Landing, rather than using the same or less money to enhance Mud Island, which to Flinn seemed like a more sensible approach. Click here to read more.Click here to listen to the 7-minute discussion (1.2 MB MP3). My transcription of the discussion follows below. Following that, I've added my own comments. LENDERMON: 2002, I think is when the City Council approved it. LENDERMON: It’s like anything else, it’s a living document. Number one is, the RDC board back two years ago, maybe longer, you know, decided that the land bridge concept, including the land bridge, shouldn’t be included, okay, so we’ve pretty much jettisoned that out of our strategic planning. And what that did was, is that it opened up a whole number of questions on Mud Island proper itself. So now what do you do? I mean Mud Island – we can talk a long time about this – but Mud Island had its issues, okay. It’s an absolutely wonderful place celebrating the Mississippi River. It’s also very detached from the land side. And even when we have concerts, the monorail system doesn’t function very well, bringing in people, and that’s 25,000 people, bringing people back and forth for a concert it doesn’t function very well…but, it’s got a unique [authority? ], you know... And we certainly think that the river model and the museum and a number of things over there have great values, okay. FLINN: When you look at the practical purpose of the Beale Street Landing Project, it seems like we have a better opportunity there at the Island. Now I know to some degree that horse is already out of the barn…but…conceptually, well this Councilperson I would have started that way [Mud Island] and moved the other way, rather than have project one be the Beale Street Landing because…maybe I’m just a bad guy, but I don’t why I’d go down to stare at the river from a park, whereas if you utilized Mud Island better, you could have more of a magnet to attract people. You know that’s more of a “if you build it, they will come” than necessarily Beale Street Landing. And it seems like it would be more cost effective. Now I could be wrong on that. LENDERMON: I think Beale Street Landing was being there for several purposes. One thing is you need something there on the cobblestones and Riverside Drive and Tom Lee Park. You have nothing, you have no place of respite for people. FLINN: But at least its not costing any money. Now Mud Island Park is. LENDERMON: Correct. So you’re .. it gets get to the issue of, you wanted to do away with, the basic concepts is, do away with Mud Island River Park. You could save a lot of money doing that. LENDERMON: And there [are] certain things you can’t do with Mud Island. No matter what you do, Mud Island River Park is still going to be detached, okay, so you’re still going to either… I mean you can’t build bridges to it, bridges don’t work, they have to be high, they have to be basically as long as it is, too far to walk. You have to have car access… What we’re hoping is, it should probably be re-looked at now, because now that you have Auction Street bridge, and you have the Grant Brother building that residential housing, now all of a sudden this is no longer detached as much as it was. So that’s why we think it needs to be re-looked at now. What’s missing here is the original context for the idea of Beale Street Landing (BSL). 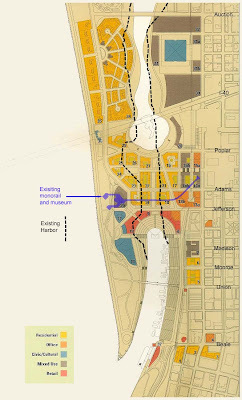 It must be remembered that the 2002 Master Plan would have completely done away with Mud Island River Park (except for perhaps the river walk), and would have eliminated the monorail, replacing it all with a Land Bridge and millions of square feet of residential, retail, hotel, and mixed-use development. It would also have done away with the current boat landing on Mud Island (as well as the marina). Therefore, the raison d’etre for BSL in 2002 was to serve as a replacement for that dock, for the big riverboats. 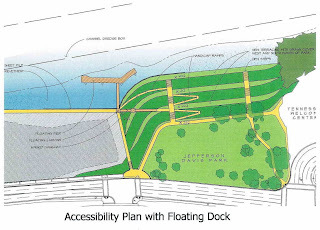 The Master Plan envisioned a new $10 million replacement dock -- for big boats only. For reasons that would make perfect sense to a marketing person, the RDC decided to start on BSL right away (though it was not needed yet), and so they held a world-wide design competition. In the competition documents, they encouraged designs on a much grander scale than was envisioned by the Master Plan, including docking for all sizes of boats. And that’s exactly what they got. They were assuming, of course, that the Land Bridge would eventually get built, and Mud Island River Park would go away. But in 2005 they were forced under public pressure to remove the Land Bridge from the Master Plan, thus eliminating the original justification for BSL. Stuck with Mud Island, and with no signs that it is going to be torn down in the forseeable future, they are in the ticklish position of having to explain why we’re spending all this money on BSL instead of putting the money into improving Mud Island. Mud Island, after all, was supposed to go away. At the recent CIP budget hearings, RDC's Benny Lendermon was asked by Councilman Barbara Swearengen Ware how he saw the future of the riverfront after Beale Street Landing. This continues a discussion she had with him during the earlier Operating budget hearing about the Public Promenade, when she had remarked that she wanted to see a great riverfront "in her lifetime." Click here to read more.Click here to listen to the 4-minute discussion (0.6 MB MP3). My transcription of the discussion follows below. Following that, a personal comment. WARE: Once Beale Street Landing is completed, what else is left to developing the riverfront, the way we envision it, where it will have all the bells and whistles, the restaurants and the walking and the… What else will there be left to really having a magnificent riverfront that is comparable to the other riverfronts that we continue to talk about, like Chicago, and one in Florida… Where was that, Myron -- the man-made river, the…? LOWERY: I’m not sure what you’re talking about. Then what I think you’ll see is, it’s like the rest of downtown, you’ll see a constant progression of things getting better. Okay, and there’s the activity and the projects on the river, frankly will probably never stop. You will see different things added and different connections added as society and Memphians and [the] community grows and prospers, or doesn’t prosper, I think you’ll see that occurring. WARE: Just remember what I told you. I want to live to see it. What's interesting here is that not once in his explanation does he ever mention the words "Master Plan." What's also interesting is that he's describing what I would call a process of incremental development -- similar, I believe, to the approach PPS recommends. Consider: If Memphis had taken an incremental development approach starting back nine years ago, instead of getting waylaid by a Master Plan, think of the riverfront we might have today. I say "nine years ago" because the RDC actually started in May 1999 with a steering committee. 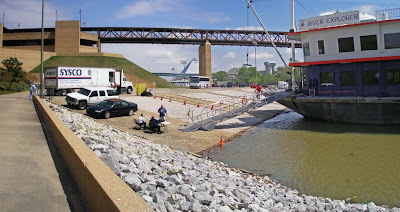 At the recent CIP budget hearings, RDC's Benny Lendermon was asked by Councilman Jim Strickland about the controversial parking lot that is part of Beale Street Landing and consumes a portion of Tom Lee Park. Click here to read more.Click here to listen to the 3-minute discussion (0.6 MB MP3). My transcription of the discussion follows below. STRICKLAND: I just have two questions that just kind of fell out of the sky. STRICKLAND: On this picture of Beale Street Landing, it looks like a parking lot has been added, close to the north side of the [Tom Lee] Park. LENDERMON: Yes, that’s part of the Beale Street Landing project. STRICKLAND: What is that parking for, and why is it needed, and when was it added? LENDERMON: I don’t know about “added.” At one point in time there was parking underneath the building. Back when we originally started the project, we frankly were going to try to do the project without any parking down there at all. I think at the request of Council as I recall, they asked if we could have some parking down there. And finally after talking to the Meanleys, or Dale Lozier frankly, and subsequently William Lozier, we found that there needs to be some minimal amount of parking down there. So we eventually created this parking lot. It’s about 50 spaces…56 spaces. It’s going to be parking for basically the daily excursion boats primarily, and the little restaurant, maybe. It will be controlled parking which just means that’s how it will be operated. But it won’t be free. It may be free if you ride the boat or it may be free if you eat at the restaurant. But it won’t be like the other parking lot you see down there, which will be the free parking for the Park, which is 120 cars. This will be 56 cars. We feel like frankly they [Lozier] wanted 100 cars for the boats, we felt like we didn’t want to put 100 cars parking lot there. It’s just going to be a flat parking lot. It’s going to be heavily landscaped along the Riverside Drive side, if you would. It’s not going to have any curb, it’s going to have removable bumper stops so that during Memphis in May it will be just a flat piece of the park, but during the rest of the year it will function for all practical purposes as a normal parking lot. But it didn’t mean for people to gather there. I mean you’re going to pay, or either you’re going to the boats and maybe get free -- comp’ed if you ride the boat. STRICKLAND: Memphis in May is okay with it? LENDERMON: It’s a long long long way, okay. I mean, it’s a long ways – probably too far to walk. It depends on when it is. If it’s Saturday afternoon in the springtime, it’s packed up with cars and the police have shut it off, you know. If it’s a Wednesday in the middle of February, then there’s probably 20 cars down there. So it depends on the time. But to answer your question, we’d very much like to do that, it’s just way too far away. STRICKLAND: That’s all my questions. Although the RDC has had a working plan for the Cobblestones Preservation for several months now, it had only been shown to "stakeholders," the State Historical Preservation Office (SHPO), RDC's own Board, and few others. The first officially public exposure was at the CIP budget hearing on May 21. Click here to read more.Click here to download or listen to a 12-minute MP3 audio of the portion of the hearing dealing directly with the cobblestones and the daily excursion riverboats (2.2 MB file). Committee Chairman Boyd is questioning Benny Lendermon, CEO of the RDC. What follows below is my transcription of the audio. The images are similar, if not identical, to the ones shown to the Committee, but I will note that they are taken from the project plan as of February 14. BOYD: Since the cobblestones kinda ties into it [Beale Street Landing], would you get into that part so the council members can have an overview of what the project is all about because that's project priorities one and two, and then we have two other, smaller projects, which we'll talk about in just a minute. LENDERMON: In your book it shows ... most of you are familiar with the cobblestones. This sort of plan view, this picture here that most of you have turned to, shows the cobblestone site. Click image to enlarge in a separate window. LENDERMON: ...about a million two of City dollars. It basically goes down below where the cobbles are intact, it sets in a small little wall with rip rap at the end to keep them from deteriorating the path. They put the sidewalk along the base, to basically frame the cobbles with some sidewalks making connectors. There's a little handicapped accessible piece to it that fits in Jeff Davis Park. It ties into the sidewalk at the bottom of the cobblestones. That won't be able to be used but about half the year, but we think its a neat feature because we think that sidewalk will at least get people down to, maybe not the water's edge, but within 50 feet of the water...we think the path will be worth taking. LENDERMON: These drawings here were the rough drawings to start with, still shows for instance the City here at Union Avenue, Ron Terry Plaza that the City previously approved back six, seven years ago. We suspect that our continued negotiations with the preservation community will have that maybe be moved somewhere else, at a more suitable site and not sitting on the cobblestones. LENDERMON: But there isn't much you're doing, frankly, to the cobblestones. You're just framing them, protecting them, making walkways down so people can get to the edge. And you're filling in the places where the cobbles are no longer continuous. And that's basically the extent of that project. BOYD: Alright so what about -- this is, I brought this from home -- will these boats be able to . . they're gonna tie up to your landing? BOYD: Alright. Now, so how many companies are now using . . . come by Memphis, south of Memphis? LENDERMON: Two companies. [...] It's the previous American Queen Lines, it goes by a different name now. They have three boats, only two boats this year. There's a big controversy about about one of their boats, whether or not it will be decommissioned because it's all wood. They're only running two of their boats this year. There's the River Barge Excursions who comes here also, will also tie up at the landing. And then of course our daily excursion boats will use the Landing itself, which will enable them to, uh ... The thing that hurts our water access now in the existing daily excursion operator business, they can't really take advantage of tour buses and things that bring in large groups of people, because they won't come to the cobblestones because it's too much of a hindrance for them. So Beale Street Landing will give that daily excursion operator, whoever it is in the future, ability to capture a much larger number of people and hopefully provide a much higher grade of service. BOYD: Well, I can speak from old experience, again gang here we go. . .
LENDERMON: Yeah, Mr. Chairman. What it is, it'd just a little bitty, it's just, what'll be there is a sidewalk with a little turn down, then we will use rip rap with the large limestone ramps going down the bank, because frankly the water will be much lower than that during the summer months. What this does is give people a chance to walk...If you're at Jeff Davis Park or you're at Tom Lee Park or at Beale Street Landing, you can walk at that lower level in the summer months, you know., at least a great deal of the time. And we’ve got to put the little wall down there anyway, so the cost of putting a sidewalk on top the walk wasn't much greater, so we think the sidewalk will serve some purpose. LENDERMON: Yeah. And the walkways you see here on this piece here coming down, they're basically...they serve the same purpose as your asphalt. In today's time, with preservation issues you have to deal with, they've done a little bit, a little more sensitive to the cobblestones. They actually would have utility trenches contained within them, so you can get electricity and water down to the edge so in case there's some opportunity for a floating restaurants or docking of boats in the future here, they have the ability to tie into that utility source. BOYD: Well, I wanted to ask you of course, the cobblestones...I call it the Meanley Line, they use the cobblestone area. Are they utilizing that now? BOYD: Okay. Now how many boats did you say they have down there -- three or four? LENDERMON: I think they only have two that are operational, but they actually have ... if you go down there, there's like five or six. Most of them are just sitting there, and aren't operational. BOYD: They still pay wharfmaster-like fees, wharfage fees of say like $1500 a month? LENDERMON: Roughly $1500 a month. BOYD: So they'd be paying wharfage fees over here to the new Landing? BOYD: You say they're going to be at the new [Beale Street] landing? LENDERMON: Yes. I think it might be a little bit more than $1500. BOYD: Yeah, I was going to say, we need to raise that wharfage. LENDERMON: The concept on Beale Street Landing is, you'll need an operator for the restaurant, gift shop, everything else, so it'll be structured much differently than just a pure wharfage fee. BOYD: Now, as far as the Cobblestone area, that's just being utilized now by the Captain Meanley boat operation. So, that'll all be vacated? LENDERMON: Yes. Well, they may still ... There's a good possibility we'll still store some of their boats there, and you'll still have "boat city." 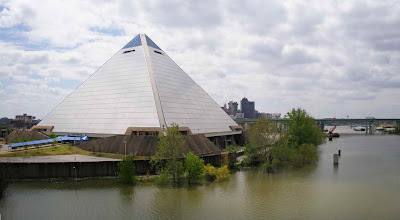 LENDERMON: We've met with them twice in the last month, and William Lozier [of Memphis Riverboats Inc] is the new owner, the son of Dale Lozier, who’s the daughter of...He's very much aware, he wants to clean it up, he wants to clean those boats up...and right now with the way it looks down there now, it's not near as large a priority, at least for him or us, either one, to get rid some of the, I don't want to call it junk, stuff he has down there. But he's aware he needs to clean that up, he wants to clean it up, he's improved an number of the boats substantially over his maybe two year tenure that he's been operating. They've still got a long way to go, there's still a lot of improvements that need to be made He's working in the right direction. We've had specific conversations two weeks ago about the fact that we'd clean these up, and we'd move the operation over there [Beale Street Landing]. They've gotta clean up that operation. I think he'd still like to, we'd still like for him to dock one or two of the boats there, you know, and they need to do all this pick up and drop off from Beale Street Landing, so he can maybe keep... There may be a need for him to actually store the boats that are not being utilized over here [at the cobblestones]. BOYD: Alright sir. Well it sure would help the appearance I think if we would get them to move those excess boats. Again years ago we had the old Warren [???]. Does anyone remember those people down there? They were on the riverfront down at [???]. It looked terrible and we got them to move over on Treasure Island down south of President's Island. BOYD: Anyway, this area here, is that a dock? A small, portable light dock on this end, or what is that? At the base of Jeff Davis park. LENDERMON: Yes. The ADA [Americans with Disabilities Act] is complicated. One of the problems with the cobblestones itself is, you're pretty much limited and you can't provide ADA access along the cobblestones. Which is why it makes docking the boats, and taking the passengers on and off very difficult, and very difficult for us as a government entity or municipality. Anything we build down there we plan to utilize year round, we'd have to have ADA access. We were able to provide ADA access at Jeff Davis Park. Looking here...you see these switchbacks here? They go down...we think there might be an opportunity to put like a floating, like almost like a little floating deck or something out here. We don't know if we can do that or not. We'll try to. But this ADA access will get you this sidewalk, when the sidewalk is not under water. When the sidewalk is under water, unfortunately, there is no ADA access...but that's the best we can do. And we don't have to provide ADA access to the whole cobblestone field because it isn't being utilized for anything specific. 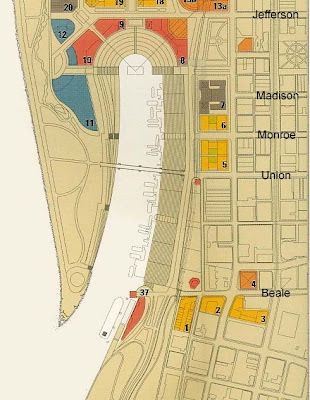 Here is a diagram from the 2002 Master Plan, showing how they and Beale Street Landing were originally envisioned. A portion of the Land Bridge is visible. 1. The Cobblestone Landing would continue to be used as the docking, loading and unloading for excursion boats as well as smaller private boats. 2. Beale Street Landing was much smaller (and one-third the cost) than it is now. It was sufficient to dock one of the large riverfoats. It would not overshadow the Cobblestones. At the May 9, 2008 Operating Budget hearing, RDC's Benny Lendermon was asked by Councilwoman Barbara Swearengen Ware regarding the status of the Public Promenade. Click here to read more.Click here to listen to the 6-minute discussion (1.2 MB MP3). My transcription of that discussion follows below. LENDERMON: We did. We took the lead on the plan. We were charged to do a master plan for the riverfront and we bought the Master Plan. And, then we also zeroed in on one little of it, based upon the Urban Land Institute's suggestion that this was really important, and we looked at the Promenade. We had this huge public input on what should happen with the Promenade. We brought that plan to the City Council in 2004, May of 2004 I think it was 2004, I'm not so sure of the exact day. 2004. And you approved it in, you know, a very interesting environment, okay. At that point, that was, RDC's challenge at that point was to to take, to us look at what we think ought to happen to that to that [inaudible], bring it to the City, and the City adopted, and at that point , the real issue was in implementing it. RDC can't deal with the legal issues. The legal issues are strictly a City administration process of...the City administration will want to resolve the legal issues that allows that plan that was approved to ever go forward. So, at such point that they do that, I'm sure we will be supportive with the facts that help their legal case just like any other person would do, but we aren't the one to pursue the legal, you know, we don't drive that train.